By the time I was in the 9th grade, I had been playing chess for a few years (as in I knew the rules) but I didn't play seriously and more often than not I lost. Then one day at the library (remember, pre-internet) I happened to find a book on chess. So I read the book and almost overnight I became one of the chess "stars" in high school. In one of the funnier incidents, I started playing chess during lunch hour and was "hustling" money which on one occasion resulted in a kid pulling a knife on me after I relieved him of a few bucks. True story. What was it in that book that allowed me to take advantage of the situation? Well, there was a lot of basic stuff, some general rules and even some strategy, however, the most useful bit of information, initially, was a table on the relative value of pieces. You know, a pawn is worth 1, a knight/bishop 3, rook 5, a queen 9 and the king "infinite" unless it's the endgame then it's more like a 4. 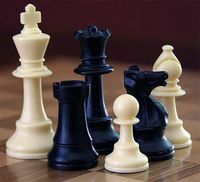 Experienced players have a "feel" for this from many games played and they can also break the "rules" by, for example, sacrificing a queen for a rook to get better position. But these are all things learned from experience and best not tried by a novice. If you are new to the game, you have no idea. When you are starting out, having some rules of thumb can make all the difference between winning and getting hustled. What does this have to do with negotiating term sheets? Well, I think a lot of newbies get hustled when negotiating term sheets because they don't know the relative importance of the various terms. Have you heard the joke about the VC who says, "I'll let you pick the pre money valuation if I get to pick the terms?" My goal here is to provide a framework that gives relative value of various terms on a term sheet and allows you to compare them on two dimensions: economics and control (or as my friend Noam Wasserman likes to say, "rich" versus "king"). In the same way that a chess grand master doesn't need rules of thumb from someone else, if you're a seasoned negotiator of term sheets then this is probably equally useless. And no, this is not based on any academic or scientific study. It's based on my own experience and, more importantly, that of a few other experts like Dave Kimelberg (Softbank's GC). Here a 10 means it is really important to get as favorable a result as possible on this term, a 1 means it is not so important and a "-" means it doesn't apply (i.e. a zero). The cool thing about having something like this is you can use it as a tool to compare term sheets (provided you can determine how favorable or unfavorable each individual term is...more on that below). Investment/price. I think there are two ways you can rank price. One is to rate it relative to your expectation and another is to rate it relative to similar companies (in terms of stage, geography, sector, etc.). If you don't have comparables, you can fairly easily get them, for example Dow Jones puts out a quarterly survey of VC deal terms which includes pre-money valuation (send me an email if you want a copy). If you're less than 80% of your benchmark, that's probably unfavorable, if you are within +/- 20% than that's fair and if you're over 120%, then it's favorable. Board of directors. This term comes down to simple math. If you give up and don't have control of the board, that's unfavorable, if it's tied, call it fair and if you control it, that is quite favorable. BTW, the reason I didn't rate the board control a "10" on the "king" scale is because even when you give up control, your board members are bound by fiduciary obligations to the firm, i.e. they can't do whatever they want. Option pool refresh. Often time this will show up as a separate term in the term sheet, however it is actually just another bite at the apple in terms of price. Traditionally there is a refresh pre-deal so that after the round the company can execute on its hiring plan without needing to expand the pool for 12-18 months. You will have to develop your hiring budget if you haven't already. Given that benchmark and your hiring equity budget, I'd say less than 12 months is favorable, 12-18 months is fair and more than 18 months is unfavorable. Preemptive rights. As you know, preemptive rights give your investor the right to invest in future rounds. This is of moderate economic value, however you are giving up some control of future financings. There is remarkably little variation in how this term gets negotiated, probably because of its relatively low importance in the grand scheme. I'm told the only area that gets negotiated is whether the investor has an "overallotment right" whereby they can take a portion or all of the pro rata of another investor in the same series who didn't participate. That said, unless something unusual is in your term sheet, it's probably a 1 for rich and 3 for king. Anti-dilution protection. Anti-dilution is a pretty important economic term. In terms of the range of possibilities, no anti-dilution would be a 5, broad-based weighted average would be a 3 and full-ratchet would be a 1. I think the vast majority of deals end up as broad-based weighted average. Very few deals avoid it altogether, but it can be done, particularly in later stage or very hot deals. Registration rights. Reg rights have some economic value and in theory you do give up some control, but in reality they're close to worthless. You can push on these and most investors will give in when pressed. You can negotiate when the right kicks in and cutbacks. But bear in mind that investors will love it if you waste time negotiating this because it is not an important term. Unless something unusual is going on, I'd rate this a 1 on both dimensions. Drag along rights. Most deals include drag along rights and like many of the other terms, the key is in the voting thresholds. I rated this a 1/5 on the rich/king scale. In terms of economics the issue is with regard to a sale of the company where the preferred stock, because of special rights, is indifferent to a deal that would be better for Common. However, the bigger issue is on the control side of the equation where you could get dragged into a sale that you don't want to do. So in terms of rating both the economic and control sides, I would say that if the thresholds are such that a single investor can unilateral drag along, that's a 1, if it takes 2 or more investors that's a 3 and if it takes investors plus either a neutral party or Common (you) then it's a 5. Right of first refusal / co-sale. I rated this a 5 because this is essentially a "lock-up" on the founders stock which seriously affects liquidity and thus value. It doesn't really affect control issues. If you read the actual section of the stock purchase agreement that describes this term it's several pages of bureaucratic procedures for a sale that in the real world you can't imagine ever occurring (which they don't). As a result, the only real counter party for selling common stock is the other investors or the company with the investors approval and they're all quite likely to low ball. Unfortunately, I've never heard of avoiding this term completely, so in terms of how to rate it, I'd say that if you can negotiate a right to sell some portion (say 20% on an annual basis) you're at a 5 otherwise if it's a standard lockup then you're at 3.
Dividend right. I rate this a 5 on the economic scale. In terms of the range, there is no dividend which is a 5, then there is a simple interest dividend which I'd say is a 3 and a 1 would be a compounding dividend. For some reason, the dividend rate has been 8% ever since I've seen term sheets. You can negotiate the rate, but the bigger battle is whether you pay a dividend and how the rate compounds. Liquidation preference. This is a very important economic term that doesn't have any importance in terms of control. The issue here is during a sale, how do investors get paid out. I'd say about 1/3 of deals have a preference at 1X but no participation, another 1/3 have a preference with a cap and participation and the balance a preference with no cap plus participation and that's pretty much how I'd rate it, i.e. 5 for 1X preference/no participation, 3 if with a cap in the 2-4X range and 1 if with no cap and participation. Protective provisions. This is very important from a control perspective but not so economically. While there are a ton of these protective provisions, the key ones relate to sale/merger of the company and future rounds of financing. As with other control rights, the key is in the voting thresholds so I'd assess this the same as 7 (drag along rights). Redemption. Finally, we get to number twelve, redemption rights. This is an almost worthless economic right. I've never seen or heard of this being exercised and most investors will acquiesce if you push on this. Unless you see something unusual, I'd rate this a 3. Ultimately the individual rating combined with the overall importance of each term will allow you to create a weighted average total for each term sheet on both the rich and king dimensions. While you wouldn't want to make a decision to take an investment on this alone, it will give you a basic idea of where the strengths and weaknesses of particular term sheets lie. It also gives some tips for negotiating. For example, you don't want to waste your time negotiating redemption rights and attorney's fees and instead, you want to go to the core of what's important to you on the rich/king scale. For more tips on negotiating with venture capitalists, check out this post 10 Tips On Negotiating With VCs. Finally, I'd love to hear feedback from folks. How would you change the ratings? Are their other key terms? Feel free to comment on this post or send me email.